3) Angélico & Jack Evans vs ? & ?? 5) Aerostar, Drago, Texano Jr. vs Daga, Joe Lider, Pentagón Jr.
Air Date: 08/20 & 08/27 – these dates are right, but everything else is wrong because they aired the Lucha World Cup. The TV chart has the correct info. KrisZ found this one. He also found the unreleased Oaxaca card, so now we’re two tapings ahead of what’s officially been released. This is also essentially the last taping which will take place before TripleMania; there’s a spacer/lame duck TV taping scheduled for early August, but it won’t air until after the PPV. The location of that last taping and TripleMania’s date were supposed to be released last week, but I didn’t see it unless I missed on the TV show. Perhaps this weekend instead, or maybe they’re holding it back for the Mexico City taping next Friday. TripleMania’s seems a solid bet for August 28, which means this show finishes airing a day before the PPV. 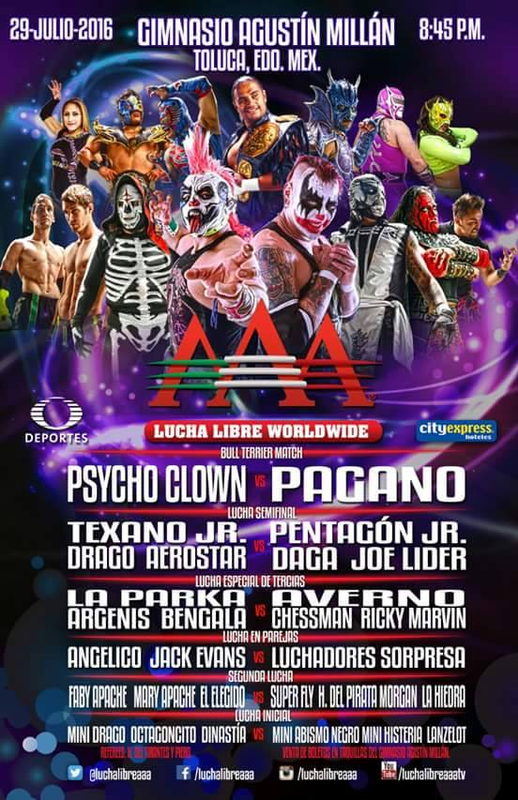 We can pair this bull terrier main event with Leo Riano’s column from Wednesday (also first found by KrisZ), where he mentions Psycho Clown versus Pagano in a mask vs hair match is likely taking place at TripleMania. Pagano has generally been a bald luchador, but has been growing out a red mohawk since he’s started with AAA. Pagano’s been completely protected in booking, beating Psycho Clown and Pentagon Jr. repeatedly in singles matches since March, which starts to make sense if a big loss was the destination all along. It’s also hard to argue Pagano’s not important enough to be in a big TripleMania, when Mascara 2000 Jr. just lost his mask in one not too many years ago. AAA seems to want to recreate the history of it’s Antonio Pena years, and Psycho getting a second big apuesta win in three years helps move him towards the tecnico fan friendly hero of AAA spot La Parka’s held for many years. The issue is I really don’t like Pagano matches. I haven’t liked them in AAA. I haven’t liked them before he wasn’t in AAA. I haven’t liked them on video, I haven’t liked them when I saw him live. The highest he’s risen is “that’s not as bad as I thought it would be, but still.” I don’t like the style of matches he wrestles, but I also don’t think he’s all that good at the style of matches either. I know there are a group of people who love those style of matches, and I think the car crash stunt show should do OK in front of a TripleMania crowd, but it’s personally a turnoff for me (and I think it’s for other people too, or I wouldn’t be saying this – my happiness isn’t really important here.) It’s not for a lack of effort – the three way for Pachuca had guys working hard to throw themselves thru many pieces of furniture, but I was barely interested enough to keep my eyes on the screen. I don’t see Psycho/Pagano as something really entertaining, or something where I’m happy Psycho gets a win, but something I’m going to have to endure for a half hour. It’s the same way those CMLL Tuesday openers must be endured, only this match is going to be on one of the biggest shows of the year, instead of something else that might get that spotlight. But what about the rest of the card? I don’t know. I do know that semimain seems really strange. It’s strange to see Texano teaming with Aerostar & Drago, but he’s slowly been moving to the tecnico side. It’s still strange to see him against the Perros del Mal – he’s been again the foreigners, and the Perros have otherwise been busy. Perhaps it’s just something to use up the bodies on the card, but it’s a little bit suspicious that Pentagon Jr. seems to be exiting the Pagano feud for a moment. AAA’s slower than we’d like with Pentagon, but they know enough to make sure he’s got something to do. Dr. Wagner Jr. is due a heavyweight title shot, but maybe this is Pentagon’s path to one of his own as well. Lanzeloth is bouncing back and forth between tecnico and rudo side, but it’s nice to have him around however we can get him. A minis title defense seems unlikely for TripleMania, but it’d be great to get one on the lame duck taping; that’s the best best way to use those.